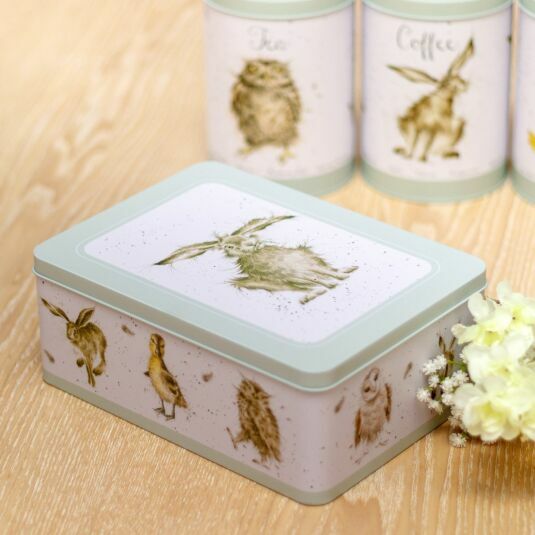 This rectangular tin is perfect for storing biscuits or cake, as it has an airtight lid. The tin is green and white in colour and has a matt finish. It would make a lovely housewarming gift, birthday present for bakers or Mother's Day treat. The exterior features illustrations of animals including a hare with a quizzical look and a second hare in mid bounce. The rear end of a duck is humorously depicted, bobbing for treats in the water while another duck is captured with wings widespread just landing from flight. A selection of feathery owls in various positions, and a cute little duckling with an inquisitive expression are also are painted in soft hues, in the expressive style that is associated with Wrendale designer Hannah Dale. Inside the tin the beautiful illustrations continue, with the underside of the lid featuring a cute duck with his webbed feet overlapping, and head to one side with a few of his feathers fluttering through the air. 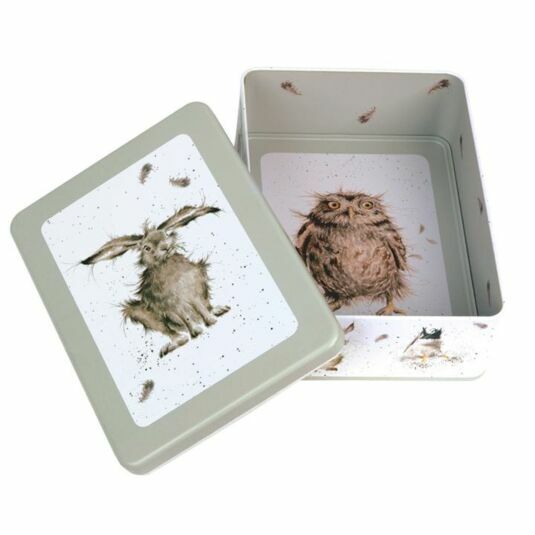 The interior of the tin is light green with brown feather illustrations scattered around the inside edges. The bottom of the tin has an illustration of a slightly dishevelled Tawny Owl ruffling his feathers, causing some to flutter around him.